P-P301h : 3.6 volt 700mAh rechargeable Ni-MH battery pack w/ Black connector for Cordless Phones. Fits Uniden, Panasonic, many others. Replaces Panasonic P-P301 and many more (see website for x-ref). Made with premium-quality NiCd "2/3AA" size cells (they are about 1.1"tall). Includes special black connector, which plugs right into your phone. These battery packs are MADE IN USA by BATTERIES AMERICA. They are available as NiCd (P-P301) or NiMH 700mAh (P-P301h). 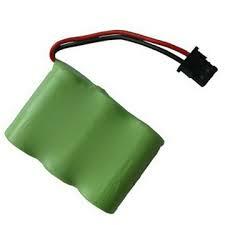 Compatible the following OEM battery model #s: AT&T 23-281, CO100P2, P-P301PA1B, 2501, CP-3H02, P-P341PA/1B, 2505CC, CPB-403B, P3302, 2510, DRCB10, PCH02, 302215001, GN-3-1/2AACP, STB-124, 560508, GP30AAK3BMS, TA248, 720, KXA-36A, TL-6156, 91085, NC-T2/3AB, TL6156, BP-T16, P-P301, TP-3 1/2AAT-B, BT-185, P-P301PA/1B, Panasonic KX-A36A.